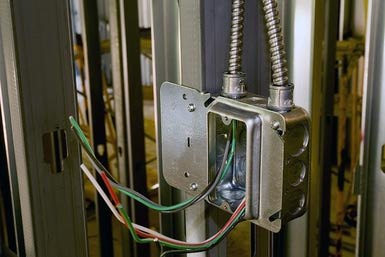 Electrical conduits is practical for wire routing and protecting electrical cables. There are several kinds of electrical conduit based on their materials: plastic, stainless steel, galvanized steel, copper etc. And also electrical conduit is either rigid or flexible. No matter what kinds of electrical conduits you choose from, it is important to use the correct size and material, and then through the wire to protect wire or cables. A major benefit of using the electrical conduit throughout the home is the ability to give greater protection to the wiring. The fired clay, fiber, plastic or metal material used to manufacture the sleeve is strong and durable, and has the potential to last for a very long time. It is easy to separate the wires from existing applications. And also passing wiring through a smooth electrical conduit is more easier process compared to working with random sized holes cut into the walls. Even though the conduit can give the extra protection for the wiring, it does have its limits, and isn’t a practical choice for every installation. A common issue relates to the small space that requires the wiring to go around a bend. While it is possible to use the flexible conduit this isn’t always able to fit the tight areas. Also, in the small space the size or width of the conduit will need to be quite small and the reduced size and volume may not provide enough room for the various wires to fit. In situations like these it may be more practical to install the wiring without the use of conduit. Using conduits will increase the cost of installing the wiring in the home or building. Perhaps we have to break the wall or concrete to place the electrical conduits. They will also damage the building. In some place, installing wiring with conduits could not a great choice. Find out more about using the flexible plastic conduit for all types of wiring working. Please click here to contact our experts to get more information and FREE QUOTE. Place an order now please kindly contact.